Belvoir and Big hART present NAMATJIRA by Scott Rankin at the Belvoir St Theatre. Scott Rankin is both Writer and Co-Director (with Wayne Blair) of NAMATJIRA. He is also the Creative director of Big hART. 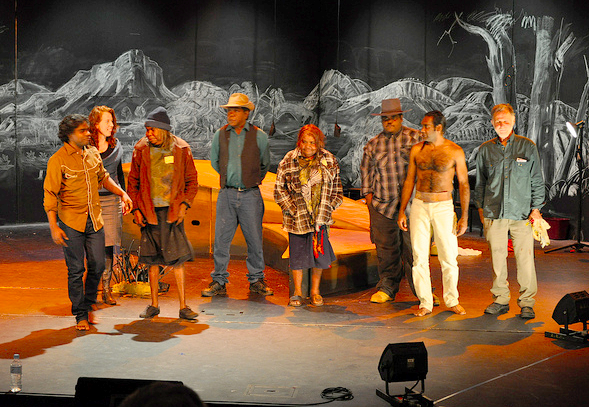 Belvoir audiences had the experience of this company’s work in the 2008 Sydney Festival co-presentation of NGAPARTJI NGAPARTJI. James Waites in his program notes for this production tells us that “Big hART is an unusual company. It creates works across Australia, usually several projects in varying stages of development at the same time. It has a very flat structure, with a pool of dedicated creatives and technicians to draw from. And it works with marginalised communities: wherever they are and whomever they might be. In Tasmania, it has included single mothers, and boys who drive cars too fast …” and in the case of the production THIS IS LIVING, working with 300 elderly people in an isolated community. Big hART is a company that works integrally with the community that it is engaged with. Indeed of a seminal nature. Such, that NAMATJIRA, the staged work, is only part of the interaction. "So, working together with a broad range of organisations and groups associated with Namatjira country, story and community, Namatjira is a multilayered project that will run into the future. It is a creative community development process; a new Australian theatrical work; a contemporary watercolour exhibition by Namatjira's descendants (At Birrung Gallery, Woolloomooloo and Damien Minton Annex Gallery, Surry Hills, September - October); trips to paint 'on country'; a documentary process; and a contribution to social policy discussion around the vital role of Aboriginal art centres." This work at Belvoir, then, is part of a bigger initiative with wider ranging objectives then just telling the "whitefella" audience in the city the story of the great Australian artist Namatjira, who happens to be also a great iconic figure in the huge canvas of the Aboriginal story and its integral and parallel contribution to who we all are as Australians in 2010. The story telling in the dramaturgical structure of the writing is almost childlike in its clarity. It is virtually a chronological monologue of the life of Namatjira, interspersed with duologal interactions with other figures, with additional contemporary asides, jokes and satirical observations and interplay. Simple historical, sociological, political story telling that renders the life of this man into an educative lesson that is inspirational, gob-smackingly horrifying, hysterically funny, and heart-warmingly moving, without sentimentality or overt didacticism. 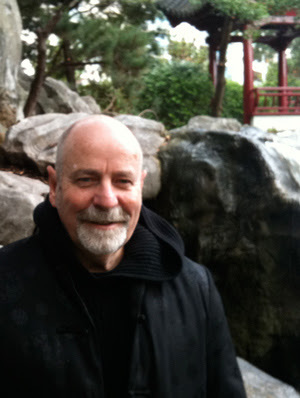 Besides the knowledge of the bountiful life of the man and the tragic and ignorant (shameful) interactions with the white bureaucracy, what this work reveals is the possibilities of the selfless great human bond that open minded human beings can have with each other to the benefit of themselves and the community about them, both in the immediate present and the future for generations to come. The revelation that the general 'goodness' that such faithful, charitable and hopeful relationships like that of Albert Namatjira and Rex Battarbee can permit, create and gift, as exemplary behaviour, a society, is life confirming. This is the second work that Scott Rankin and the performer/actor Trevor Jamieson have brought to Sydney at Belvoir and it seems to me the bond between these two men/artists is as valuable to the Australian community as that, that they tell us about, in this work. Awe inspiring. Personally, it focused the real daily dilemma of the Aboriginal artist and his/her conflicting responsibilities of being part of two cultures and the struggle to honour both and all their demands at the one time. Certainly it underlined their unspoken conflicts that arise during their interactions. What, I, as a generally ignorant Anglo-Celtic person/artist have misapprehended and judged as unacceptable behaviour, now demands pause and consideration. This work then, though simply written, is invaluable for the insights into the cultural complications of the actions of these fellow brothers and sisters, that otherwise may have remained shrouded and misunderstood. It stands beside Rolf de Heer's film TEN CANOES, for me, both, in cultural impact and strength of vision. SAMSON AND DELILAH as well, differently, but similarly. First, the production sensitivities that Mr Rankin and Blair have wrapt around this presentation are marvellous. The delicate 'tribal' negotiations to permit this story even to be told needs to be acknowledged. Thanks to the Namatjira family and the Ntaria people around Alice Springs (Hermannsburg Mission). Thanks to the family of Rex Battarbee. The visual beauty of the chalked 'ghostly' backdrop on the black back-walls of the stage space, created and still evolving during the show by the descendants of Albert Namatjira, is both aesthetically and spiritually humbling, disarming in its impact. The layered polished, levered wooden landscape sculpture that Genevieve Dugard has created, centre of the stage, is also a work of 'art' and serves, in its mechanics, many levels of engagement. Costumes by Tess Schofield are beautiful and very clever, especially in creating, simply, the many guises that the actor, Derek Lynch, has to impersonate. Nigel Levings completes these visual aesthetics with a lighting design of exceptional artistry. The music composition and live performance (almost imperceptible) by Genevieve Lacey is haunting and always apt, accompanied by a Sound design by Jim Atkins that is hugely atmospheric. Secondarily, the performers: Trevor Jamieson is the central raconteur. Good looks and charisma in bucket loads is also abetted by ease in simply drawn characterisations — physical and vocal adjustments —and the ability to seamlessly, un-flappably slip in and out of time zones, people and places as all natural story tellers seem to have the ability to do, without losing us, nary a false step. It is a very dexterous skill. Assisting charmingly to the telling is a young shameless shape shifter,Derek Lynch, who glories in the impersonation in 'drag' both male and female, with a range of figures as variant as a local stockman to Albert's wife through to the young Queen Elizabeth II. He is amusing and also musically very useful and affecting. That the experience works so well is due much to Mr Rankin with the assistance of his co-director Mr Blair. In one extremity of my own anticipation of the work I may have approached the Belvoir Theatre with a sense of cynicism about what I was about to see. Despite, (or perhaps, because of) the direct simplicity of the actual text, I left the theatre with what renowned English critic, Michael Billington requires from good theatre going, the three E's: Entertainment, Enlightenment and Ecstasy. The most valuable of them, for me, on this occasion being, ENLIGHTENMENT. Catch it with your children and grandchildren - our culture is better off for Big hART's endeavours, if this production counts as evidence. Satisfying is it not, to have the THE NEW ABORIGINAL & TORRES STRAIT ISLANDERS GALLERIES opening the same week at the National Gallery of Australia in Canberra? ART is still important then? I have just come across your response - I'm not in town right now. Yes it's nice that you liked the show - but even better that you had so many very interesting things to say. I think you 'received' the show the artists involved were aiming to create. There has been enthusiasm but not much insight. Let's see how it goes over next few years - and let's hope it comes back to Sydney again after a year or two of creative growth.